This post by Tom Pruen, Chief Scientific officer for the Electronic Cigarette Industry Trade Association was originally published here, and is posted below with the kind permission of ECITA. 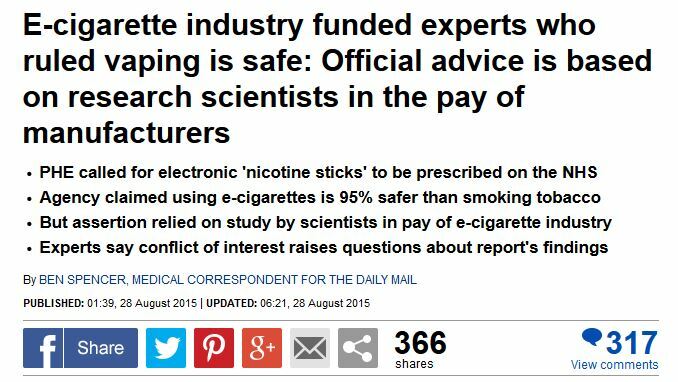 An editorial in the Lancet identifies that 3 (out of 11) contributors to a single point of research had previously been paid as consultants by various parts of the e-cig industry (and most would have been paid at some point by the pharmaceutical industry). As the pictures show, these stories were shared widely. Do these stories accurately reflect the truth? The answer is very simple: No. While it is true that there were people on the panel who had been consultants for the e-cig industry, on unrelated work, the vast majority did not. The methodology of this work was also somewhat subjective (although, as Prof. Nutt points out , the same methodology has been used for Drugs of abuse, without comment, and indeed the report itself was not criticised at the time of publication). Nor is it clear why one of the author’s involvement with an Italian anti-smoking charity (LIAF) would be implied as a conflict of interest – this seems exceptionally bizarre! and largely disregard this particular work, would it affect the conclusions of PHE? As someone who is closely tied to the e-cig industry, I am not privy to the workings of PHE, but equally, as someone with a professional interest in the science surrounding the e-cig debate I am more than passingly familiar with the evidence. 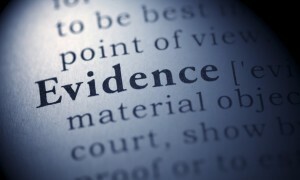 There is a significant body of evidence – too much, in fact, to easily detail (although there’s a bit of list in this previous blog, which shows how little the debate has moved on). All the evidence to date shows that, when used under real world conditions, e-cigs generate somewhere between much less and none of the harmful constituents of smoke. One of the most cited studies on e-cig vapour described that levels were 20 to 450 times reduced compared to smoke. Much of the evidence is in a similar vein, either known-to-be-harmful smoke constituents are completely absent, or present at less than 1/20th of the levels in smoke. If the highest levels of known-to-be-harmful chemicals are 1/20th of those in smoke, that would make e-cigs much less than 95% of the risk of smoking. There remains some uncertainty about the novel exposure to some of the ingredients in e-cigs (although all are considered to be safe at similar levels through other routes of exposure), so an estimate of only 95% safer, is actually quite conservative, and cautious (and almost certainly the estimate of residual risk at 5% is too high). On the basis of this evidence, unless the unnamed author(s) of the Lancet article consider the authors of the PHE report to be either incompetent or dishonest, it is unclear to see how this attack on the conclusions of the PHE report can be justified. “The ongoing negative media campaigns are a plausible explanation for the change in the perception of EC safety”. “Public Health England has a statutory responsibility to ‘promote the health and wellbeing of the nation’. It has not fallen short. It has fulfilled its mission by putting the message out clearly – while electronic cigarettes are not risk free, they carry only a fraction of the harm caused by smoking”. Promoting doubt and fear over the safety of e-cigs is costing lives, and it needs to stop. After this blog was drafted, the authors of the PHE report responded directly to the Lancet article, and this response is recommended reading. [i]The irony of the Lancet casting aspersions on someone else’s peer-review process is staggering. The Lancet had a failure of peer review which is still costing lives to this day, when they published Andrew Wakefield’s paper linking the MMR vaccine with autism. The article was published in 1998, partially retracted in 2004 following the withdrawal of support from 10 of the 12 co-authors, but was not fully retracted until 2010. Wakefield’s ‘evidence’ is still poisoning the vaccine debate to this day.